Not entirely sure about this color combination, but the Melon Mambo really pops IRL. It does, however, make the Soft Suede look very khaki-ish. I layered Soft Suede, Crushed Curry, a sheet from the Lovely Flowers ds and accents of Melon Mango. The Crushed Curry layer was stamped with Aida in CC and the edges sponged with Soft Suede. The central image is stamped with the spatter pattern of Itty Bitty Backgrounds in Soft Suede and the edges are also sponged with SS. I flipped the Soft Suede polka-dot ribbon and used the white Urban West rub-ons on the plain side. The flowers were embossed on Shimmery White cs with white detail ep and I used the watercolor roses technique to color them. Wow Lisa, it just keeps getting better and better. This is gorgeous. I am falling in love with the new in-colors and I don't even have mine yet (not until Thursday). At least they are in Mr. Brown's truck. 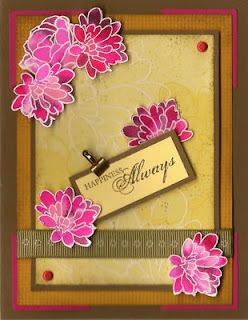 Love your use of the watercolor roses tech on the flowers! Just beautiful. Love the colours,the roses are wonderful. Lisa, I love the color combination! You shouldn't worry, it's a gorgeous card!